Robert Phillip Duvin was born in Evansville, Indiana, on May 18, 1937. A 1954 graduate of Benjamin Bosse High School in Evansville, where he competed in Golden Gloves boxing matches, Duvin next attended Indiana University in Bloomington. He received his B.S. degree, majoring in Business, from Indiana in 1958. He then enrolled in the University's law school, from which he received his J.D. in 1961. After graduation, Duvin spent three years of service in the military. He then moved to New York and earned a LL.M. from Columbia University (1964). 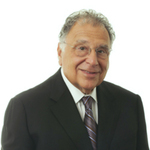 Duvin’s legal career began when he joined Burke, Haber & Berick, a Cleveland corporate law firm. He spent seven years with the firm, was named a partner early, but ultimately decided to strike out on his own in 1972. Over the next few years he helped start Duvin, Cahn, & Hutton, a firm which grew to become a major labor and employment law firm, representing some of the largest companies in America. Before it merged with Littler Mendelson in 2007, the firm was selected by The American Lawyer as one of the top six management labor law firms in the country. The list of professional honors and recognitions Duvin has received is astonishing. He has been recognized as one of the Best Lawyers in America, every year between 1983 and 2018. He has been named a Super Lawyer, a Top Employment Lawyer, a Senior Statesman in Employment Law, and named to the First Tier of Labor and Employment Lawyers. Robert Phillip Duvin was inducted into the Indiana University Maurer School of Law Academy of Law Alumni Fellows in 2013. "Robert Phillip Duvin" (1937). Notable Alumni. 114.